Babies will love to see Flapping Fiona flap her wings! Pull the clip to make her vibrant wings flap up and down for cause and effect play. Babies can also pull/tug on each leg to change the length(s) for gross motor skill development. 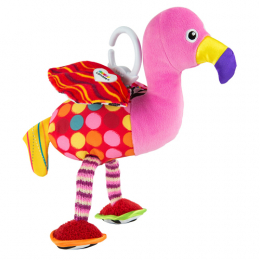 The Lamaze clip lets you hook Fiona to prams, carriers and changing bags to her along for on-the-go fun.